RENO, Nev. Republican vice presidential nominee Paul Ryan kicked off a final full day of campaigning here as he tried to rally support in states that are either deadlocked or still have President Obama maintaining a slight lead. With GOP nominee Mitt Romney focusing his efforts in the East with stops in Florida, Virginia, Ohio and a final rally in New Hampshire, Ryan planned to spend his last full day on the campaign trail in Nevada, Colorado, Iowa and Wisconsin. Like Romney, Ryan will also visit all-important Ohio, which is viewed as a must-win for the Republican ticket to get to the necessary 270 electoral votes. Between them, the two will cover every major battleground state in the country. Ryan has the biggest challenge, as most polls show Obama with stubbornly persistent leads in Nevada (the Real Clear Politics polling average has Obama up 2.8 percentage points), Iowa (Obama up by 3), Ohio (Obama up by 2.8), and Wisconsin (Obama up 4.2). Only in Colorado, where Ryan has campaigned three times in the past week, does the website's average have Obama up by less than a percentage point. Hoping to make gains among the dwindling pool of undecided voters, Ryan said Obama's presidency has been "littered with broken promises." He cited a failure to cut the deficit in half, to reduce partisanship in Washington, and a still high unemployment rate. "Look the president sounded great four years ago. He made all these wonderful promises and the hope and change sounded good to a lot of people," he said, as the audience rumbled its disagreement. "We are crisscrossing the country, Mitt and I are, because we are asking you to work with us, to stand with us to get our country back on the right track. 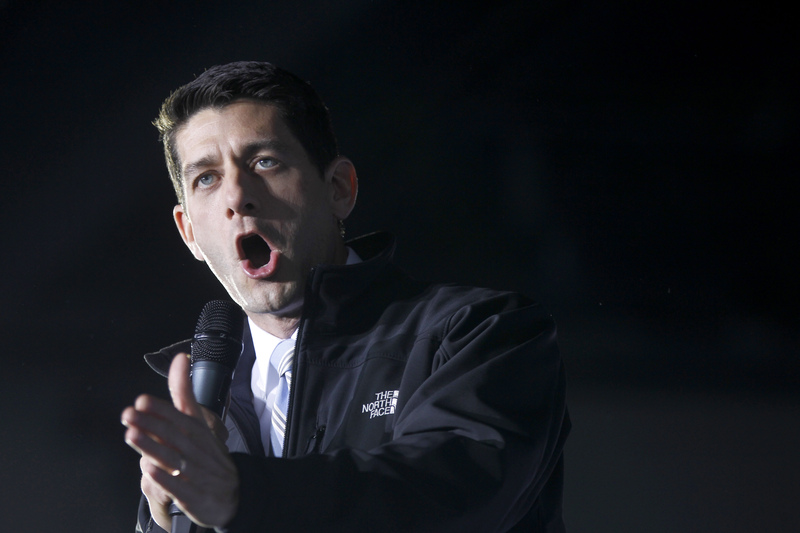 We know the kind of choice that's facing us," Ryan said. " ... Join this movement, help us, because together we are going to fix this." The climb in Nevada is uphill. The state's top political reporter, John Ralston, has predicted that Nevada will give its six electoral votes to Obama as it did four years ago. "I know the Romney folks and some RNC operatives believe they can still win, despite trailing by nearly 50,000 votes in early voting. But they need everything to break right - President Obama hemorrhages Democrats and independents vote in huge numbers for Romney, two things I do not see happening," he wrote on Sunday. In addition to the Reno stop, Ryan will hold rallies Monday in Johnston, Col., Des Moines, Iowa, Vienna, Ohio and a final rally in his home state in Milwaukee, Wis.